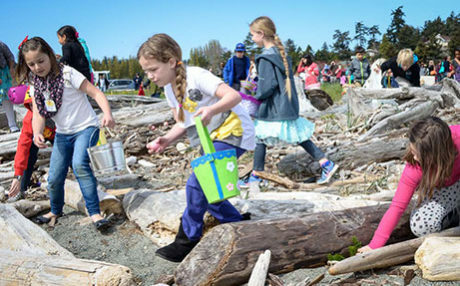 The San Juan Islands’ Firefighter Association will again host the annual Jackson Beach Easter Egg Hunt on Easter Sunday, April 21 at 1:00 p.m. The egg hunt is free but we are seeking donations to the San Juan Island Food Bank (money or food donations gratefully accepted). This annual family fun tradition is more than 25 years old and hosted by the San Juan Island Firefighters’ Association. More than 1500 eggs will be cooked, dyed and hidden on Jackson Beach. Children will hunt for eggs in four different groups organized by age. Children will hunt for dyed eggs as well as plastic eggs that have coupons for prizes (limit 2 per child). There will also be a special “Golden Egg” with a coupon for a fire prevention prize (one per group).